Radio stations have known how to adapt very well to the digital era, as well as quickly joining the streaming broadcasts, they have grown in number and some applications like RarmaRadio compile them and allow the user to have access to all of them from the same application. 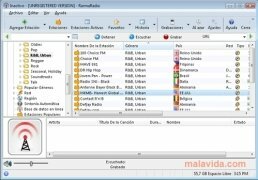 From RarmaRadio it's possible to tune into hundreds of radios, even services like Last.fm, there are also quite a few television broadcasts available, that make RarmaRadio one of the most complete streaming applications. 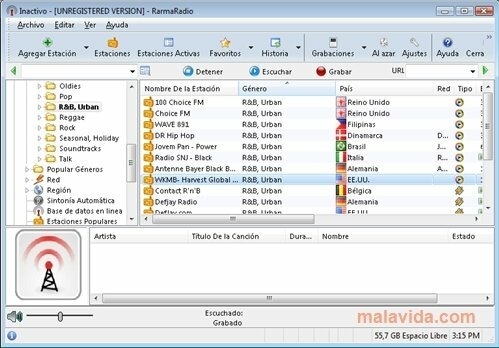 And if this wasn't enough, any broadcast that we receive via RarmaRadio (some are played via Windows Media Player) will be able to be recorded and stored on our computer. The program's interface is very clear, with the play and record buttons clearly visible, divided into three important parts: the list of categories (where we'll find the radios, televisions and other organized according by styles), the radio list (that will load when we select the category) and at the bottom the information of the broadcast that we are receiving at that moment.